Enveloped, spherical, about 120 to 140nm in diameter. The tubular nucleocapsid is bend into an open torus hence the name “torovirus”. Monopartite, linear ssRNA(+) genome of 28kb in size. Capped, and polyadenylated. 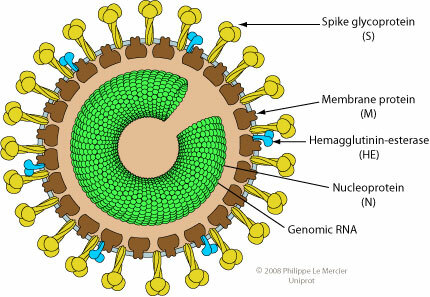 The virion RNA is infectious and serves as both the genome and viral messenger RNA. Genomic RNA encodes for ORF1a, as for ORF1b, it is translated by ribosomal frameshifting. Resulting proteins pp1a and pp1ab are processed into the viral polymerase (RdRp) and other non-structural proteins involved in RNA synthesis. Structural proteins are expressed as subgenomic RNAs. Each RNA (genomic and subgenomic) is translated to yield only the protein encoded by the 5'-most ORF. A putative 30K protein overlapping ORF1a might be expressed from an alternative CUG codon . Fusion of virus membrane with the endosomal membrane (probably mediated by E2), ssRNA(+) genome is released into the cytoplasm. NATURAL HOSTS Human, cattle,pig, horse. Equine torovirus Berne virus induces apoptosis in infected cells at late times postinfection via host caspases activation .